Milano, Milano, with the Italian accent, as Chiara Ferragni would say. The shows taking place there were very creative, with lots of different styles. Firstly as you can see on top, Emporio Armani played with pink and grey which is a combination that I loved when I was a child. If there is one thing I can assure you 100% is that Chinese people love pink. This color is often perceived as a little girl’s favorite color and in the Middle Kingdom’s culture, ladies do not necessarily want to grow up to the woman stage, this is why they are always looking for youth, white baby skin, innocent style… They also look younger than their age most of the time. One of the reason is also due to their clothing choices. In Paris for instance, teenagers or young adults are wearing very classic clothes giving them a more mature identity, which is not the case in Asian countries. To me, the second look is going to increase sales over there while the first outfit that has this casual street style is going to be more appreciated in Japan. Whereas looks n°3 & 5 present jacket and bomber that you can simply put on your shoulders without wearing it properly as well. And this will give a sporty chic touch to what you are going to pair it with, wether a dress, a skirt or a pair of trousers. Then the fourth look is perfect for spring if you want to reflect a chic aura around you. Enough said, now moving on to the next ones! 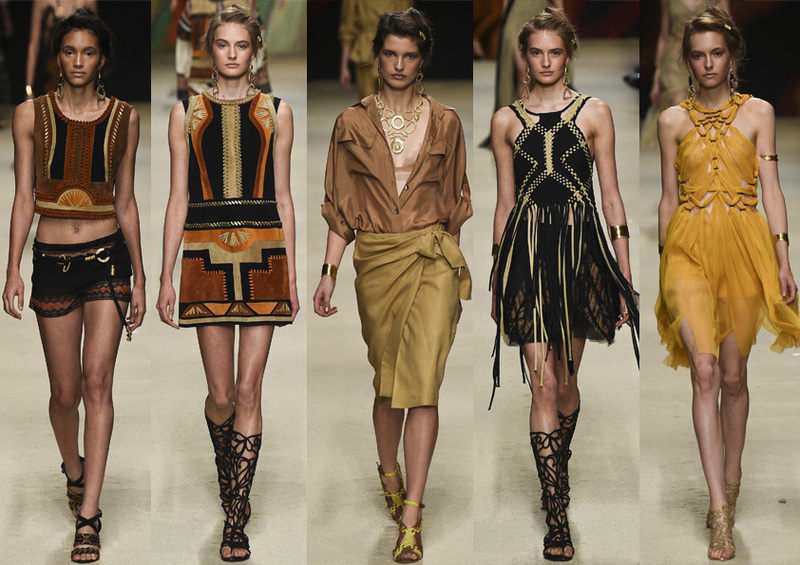 At Alberta Ferreti, pieces of leather, fringes and straight cuts define her tribal collection. The second look and some of her previous collections’ dresses can be related to what Olivier Rousteing creates for Balmain. Some cuts and prints are very similar. Otherwise we find each season her signature. The sandals that are going high are well done, very delicate and nice compared to some other brands that are creating too crazy pairs. 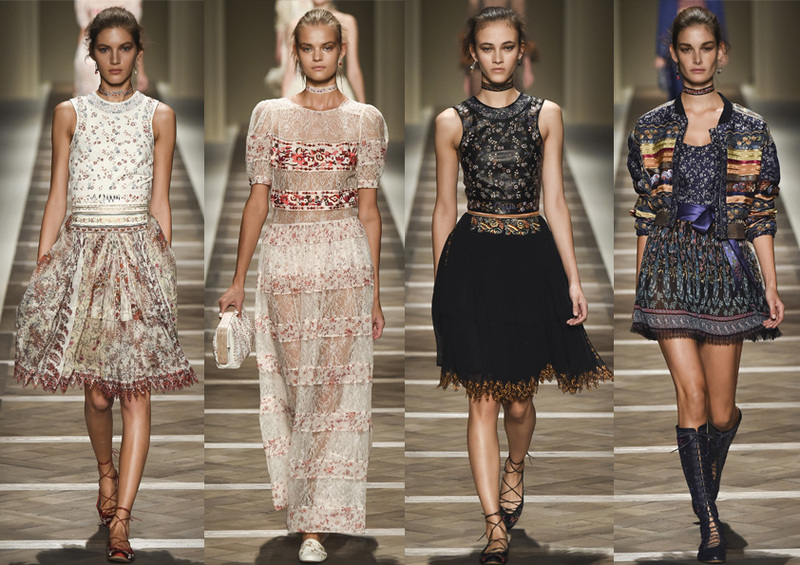 At the mean time Etro is showing off a collection that has a slightly Valentino Couture feel. The dresses are really gorgeous, feminine and it emphasizes a real Italian woman. I am especially sensible to the first white dress: my love at first sight. The second look follows this new trend consisting of alternating pieces of lace and fabrics giving a touch of sexiness to the outfit. Another typical Italian brand by excellence is obviously Dolce & Gabbana with their craziness, their creativity, their talent. Selfies were on the runway: the model wearing the yellow had a phone and was basically taking a photo of herself in the middle of the stage. The flowery headphones of the second picture is discreet within the entire look and it does not even feel like they are here. It mostly looks like it is a hair accessory, a crown for example. 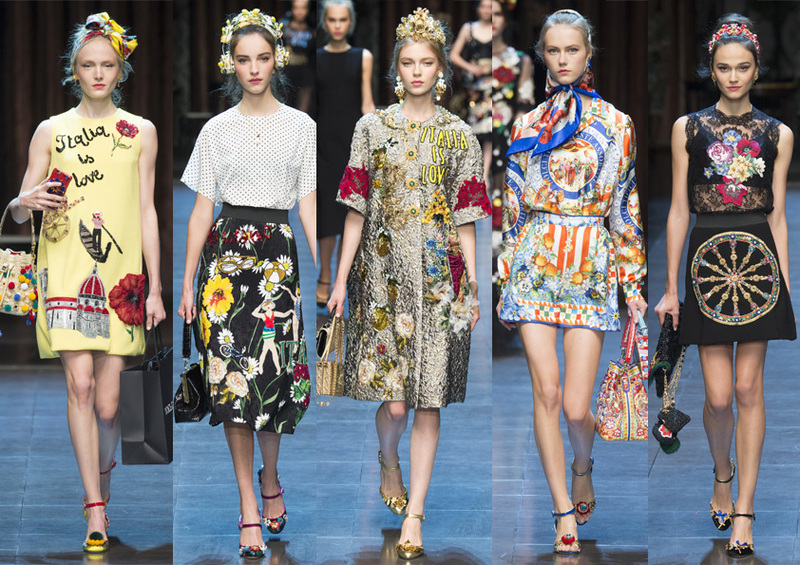 But above all, I find it brilliant that by one look, we can distinguish D&G from the others. One big surprise and some kind of a revelation for me: Au Jour Le Jour found a new direction. This season is particularly different from the previous ones in terms of style. This time, it is more fashionable and more wearable. The skirt of the first look is the piece that is recurrent over the collections and this simple and straight cut is easy to wear, you only have to match the colors now! Moreover the print with splashes of red paint is very nice on the white background, it is not too much, just the right amount. 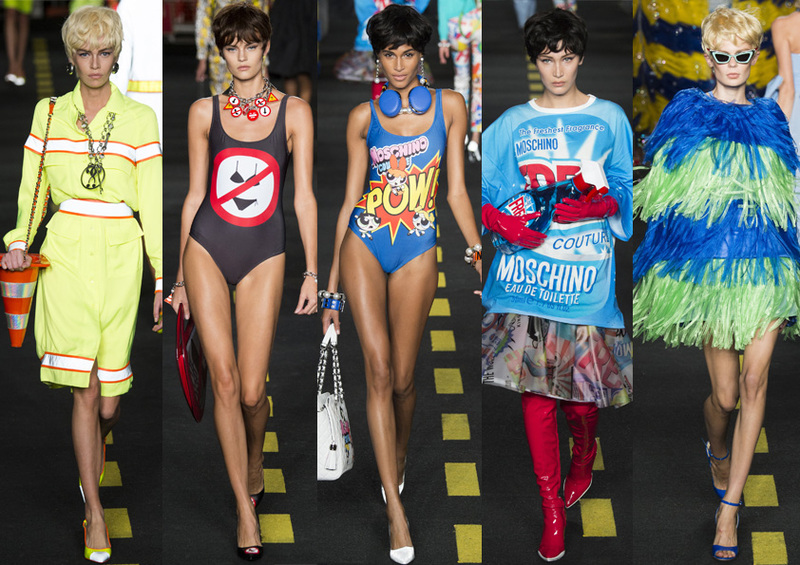 What would be MFW without Moschino? Jeremy Scott comes back with another surprising collection. We all wonder before the show what it would be, what theme he is going to choose. Always influenced by pop culture, it is reflected through his designs. 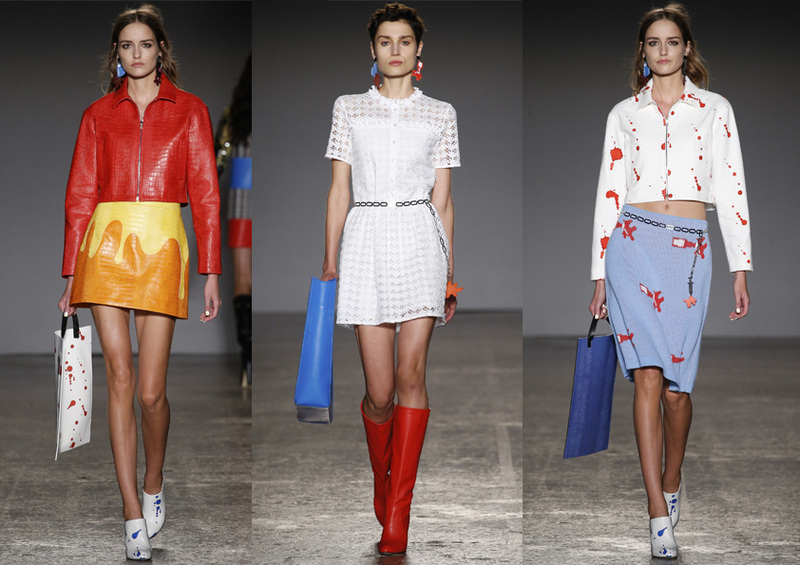 This spring 16 runway is all about traffic signs, washing machine, cleaners, … and also the Powerpuff Girls (in french: les Super Nanas, isn’t it so cool?) print! Unexpected right? The funny thing is that the cleaner Iphone case is all over Instagram now, just like last time with the McDonald’s one. Are we in the buzz game or does he really like it?